Welcome To Our "Treehouse Cabin"
We say it 'feels like a giant tree house' because it's very open indoor / outdoor style living and located in a private setting that is surrounded by trees. The house is centrally located in Wild Acres, one of Maggie Valley's original mountain neighborhoods. It's been completely redecorated and updated with all conveniences featuring 2 wrap around decks, hot tub, fireplace, BBQ, WiFi, game room plus 3 bedrooms (2 queen / 1 king), 2 full baths and fully equipped kitchen with anything a cook would want... right down to the spices! :) Even better it is within walking distance of our other ‘Buckhorn Cabin’ ( VRBO #899156 ) which is on the same street! This means, between the two cabins, we could accommodate up to 14 people for larger gatherings. At 3500 ft. elevation, we're located in the heart of beautiful Maggie Valley. Minutes from everything... Blue Ridge Parkway, Great Smoky Mountains National Park, Cataloochee Ski Area, downtown Waynesville, shopping, restaurants and about 30 minutes to Asheville, the Biltmore, Harrah's Casino and much more... like mountain streams, Lake Junaluska, great waterfalls and 19 of the highest peaks east of the Mississippi. Access is easy for any car or van because the roads are paved and state maintained to within about 100' of our driveway. We have two large parking areas each capable of accommodating two normal size vehicles. That said, we are about halfway up the mountain and there is a short, paved but steeper incline so we don't recommend trailers or motorcycles. We created it as our vacation home & studio to be a peaceful, inspirational getaway especially for those looking for a place to 'get creative'. We chose Maggie Valley for it's natural beauty, convenient location and great climate. As artists and photographers ourselves, we think this beautiful valley nestled in the Great Smoky Mountains is one of the most beautiful areas in the world! We want everyone who stays at our mountain home to enjoy it as much as we do and are committed to doing everything we can to make your stay an enjoyable, memorable experience. We've been together as artist partners for over 30 years. Our background in commercial art gave us the opportunity to develop our art, photography and printing expertise. We've now shifted our focus to fine art and specialize in photography, digital painting, printing and custom framing. Today we enjoy working with other local fine artists and photo enthusiasts who want to sell or display their own personal work. We chose our 'Treehouse Cabin' because we wanted a vacation home in the mountains, in a beautiful location, that would be a great creative getaway. We think the Smoky Mountains, and particularly Maggie Valley, offer some of the most beautiful scenery and most pleasant places to visit in the entire country. The climate is great, not too hot, not too cold, the people are friendly and there are so many things to enjoy from scenic mountain drives on the Blue Ridge Parkway, to hiking the Smoky Mountains, to fishing, waterfalls and of course photography and painting. Since we are not their full time we decided to share it with others who want a peaceful getaway in the mountains. We fell in love with our home because of the open indoor / outdoor feel of it... as soon as you walk in you feel like you're in giant tree house. The two wraparound decks feature a hot tub, southern style rockers, BBQ grill, hammock, porch swing and outdoor dining area. There are 3 bedrooms, 2 baths, completely equipped kitchen, fireplace, laundry and game room. We're perfectly located, in the heart of Maggie Valley in of its original mountain neighborhoods... close to restaurants, bars, tourist attractions, shopping, golf, Lake Junaluska and much more. Electric Heat Pump - Dual System for upper and lower levels. Good parking for 4+ cars. Easily park 2 cars on both upper and lower parking areas. Washcloths, hand / bath / hot tub towels are provided. Open living room with fireplace & flat screen TV, wall of windows along wrap around decks and open to dining and kitchen areas. Full size refrigerator includes ice maker in the door. Kitchen is equipped with everything you need... even some basic condiments are provided. There are 2 dining areas, close to each other, separated by glass wall. Indoor table seats 6 and deck dining table seats 4. We do not have local broadcast, satellite or cable. For watching TV we use Roku streaming internet... you can access channels like Netflix, Pandora, PBS, Network News, Weather, etc., etc. There's a DVD player attached to each TV. Dozens of good movies are also available. The lower level contains what we call the game room because one side is a TV / DVD area, plus a game table area, and reading area. The lot is about an acre with lots of trees... it does have a bit of yard but most of it is a wooded mountain slope. Two wrap around decks feature the Hot Tub, BBQ Grill, Southern Style Rockers, Porch Swing, Hammock and outdoor Dining Table. Accommodates 4 people, sits on deck with beautiful forest view, nearby hammock, chairs and table. The treehouse was a great home base for exploring GSMNP--the southern entrance was about 40 minutes away via Blue Ridge Parkway and some popular trailheads (Charlie's Bunion, Alum Cave Bluffs) are about a 60-70 minute drive. It was great to return each evening after long hikes and get into the hot tub! As others have said, the deck and rocking chairs and grill and views and seclusions are all top-notch. Gary is a warm host--we arrived to coffee beans from a local roaster, well-stocked kitchen and bathrooms, and comfortable beds. He sent a super-helpful map in advance (don't rely on GPS to find the place) and directions to the nearest full-service grocery store (15 minutes away). The house is in overall good condition, although a few items have been well-used. The pool table is useable but wobbly and doesn't roll true and the pool cues need replacing. The ping-pong table net is jerry-rigged (looks like it had been broken and a repair attempted), so we couldn't really use that. We weren't there for the game room, but on a rainy day, we did try it out. The other features of the home certainly outweighed these, but just be aware of it in case it's important to you. One other thing to be aware of. As Gary notes in the kitchen, the oven temperature read-out is very hard to see--so hard, in fact, that we couldn't tell what temperature we set. We guessed and it turned out okay. But if you are a cook with plans to use the kitchen a lot, you might want to check about the usability of the oven. The other appliances worked great. All in all, we loved the location, setting, and amenities, and Gary's hospitality and thoughtful touches made our stay even better. This was our first trip to the Maggie Valley/Asheville area. We hiked, golfed, hit some microbreweries and did the Biltmore. The Treehouse was awesome! Probably more than we needed for 2 people but in seeing the pictures we couldn’t pass it up. Everything you would need. Best stocked kitchen area we have had in a VRBO. Scenery was spectacular! Nice hot tub and 2 wraparound decks. A lovely property! A wonderful ski weekend with our two adult sons, their spouses, two ten year old girls, and small dog was made perfect with this home! The house was completely furnished with all linens, gas fireplace in living room, kitchen items, gas grill, fire pit, and comfortable and plentiful seating. We appreciated the care taken to welcome us upon arrival with warm lighting and soothing music tuned on the living room TV. We look forward to staying here again next year. Thank you for staying with us! We're glad to hear you had such a nice time. We always enjoy going there and are glad when others get to enjoy it as well. We would love to have you and family back anytime! 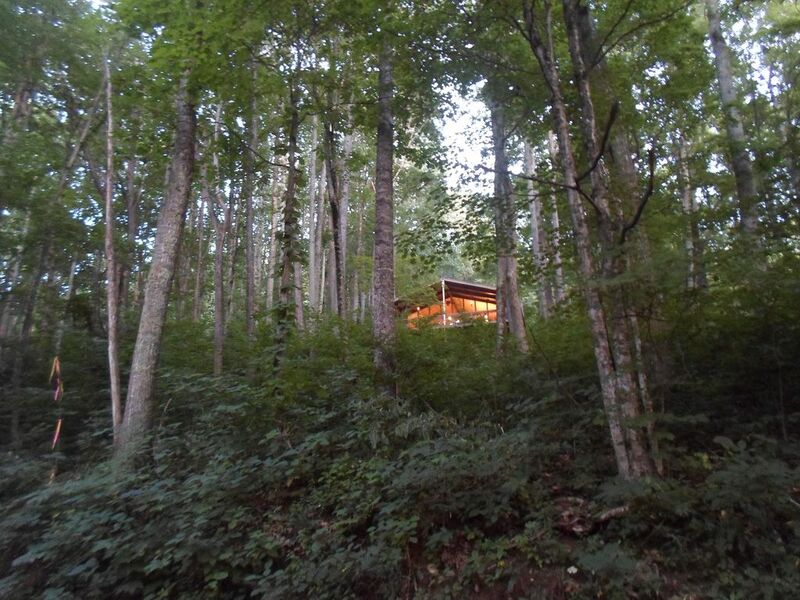 A beautiful home in Maggie Valley. It is close to the main road for easy access. We stayed in the treehouse in late January. The place was beautiful. It had plenty of room for our 5 adults and one child. Everything there worked fine. It was very clean. The artwork was beautiful. The fireplace kept us warm and there is also upper and lower Heat pumps. We are native Floridians that came to see snow. There was none when we got there! Then the weather alert came for the coming winter storm! The owner contacted me to make sure we were ready. It came and we saw snow but it wasn’t enough to stick. We found snow in town and some beautiful snow up on the pass to Cherokee. We saw Soco Falls one day almost ice free and the next it was covered in ice and snow. Simply beautiful. Us boys went snow tubing in town. We drove up to Cataloochee ski resort. We also drove to Cataloochee Cove to see the elk ( the drive is not for the faint at heart but is easy ). I have no complaints on the house. I plan to stay there again. Next time I would prefer to come in summer. We are water people and would prefer swimming in the rivers and falls. I also would recommend you make sure things aren’t “ closed for the season “. This didn’t bother us but for some people it would. All in all I highly recommend the treehouse and Maggie Valley. The owner Gary is awesome and I thank him for letting us stay in his wonderful home. Steven... thank you for such a nice and comprehensive review! We're so glad you enjoyed the house and got to do so many things in the area. Maggie Valley is beautiful all times of the year... and yes, summer / fall would be a great time to return. There are many things going on in the area. If you want to experience waterfalls / swim, etc. Be sure to make a trip to Sliding Rock Falls... lots of fun. Look forward to having you back anytime! This is our 5th year staying at the Treehouse cabin. We come back year after year to enjoy the privacy, the gorgeous views, the comfortable rooms, and of course, the hot tub! It just wouldn’t be a girls’ trip if we stayed anywhere else. The owner is friendly, helpful, and responsive. Highly recommend! We have been coming to Maggie Valley for several years and truly enjoyed this beautiful home. The views and the amenities were top notch. Thank you for the wonderful getaway!